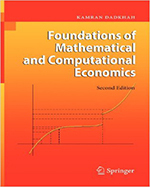 This is a book on the basics of mathematics and computation and their uses in economics for modern day students and practitioners. The reader is introduced to the basics of numerical analysis as well as the use of computer programs such as Matlab and Excel in carrying out involved computations. Sections are devoted to the use of Maple in mathematical analysis. Examples drawn from recent contributions to economic theory and econometrics as well as a variety of end-of -chapter exercises help to illustrate and apply the presented concepts.